If you ask someone how to cook bbq chicken, you could get a variety of answers. Depending on the area where the person is from, each has a different interpretation of barbeque chicken. I have had this discussion many times with family and friends in the years since I moved from the North to the South. In Ohio, we always considered cooking bbq chicken to be baking in the oven with a lot of bbq sauce (usually a tomato base) over the chicken. Here in the South, if you ask how to cook bbq chicken the answer is cooking on some form of a grill or open fire and NO sauce is cooked on the meat but offered on the side. Big difference! The Southern states are traditionally known for its barbeque pork; more pork was eaten throughout these states than any other meat. Being known as being lower economically, the people took advantage of the many wild pigs; these can still be found running wild in Florida. As times got financially better the people started turning more to eating chicken. The same process of cooking and serving pork were converted to cooking and serving chicken. If you ask around the United States how to cook bbq chicken, the answers will center on the types of sauces to serve with the chicken. Even throughout the Southern states there is a big difference in the sauces served with the bbq meats. Many areas are recognized for its specialty sauce to serve with bbq chicken. North Carolina is regionally divided by three basic types of sauce; the west part is a heavy ketchup taste, the central is a combination of vinegar and ketchup and the eastern is primarily a vinegar base. If you ask around Tennessee, Alabama or Georgia how to cook bbq chicken, the answer will be a sweet sauce; this is not surprising because “sweet tea” is also the choice of teas. In Florida, most of the time barbeque chicken is served without any sauce but with a delicious flavor from the cooking. Various sauces are usually on the table. The following is a typical saucy barbeque of the North. Combine above ingredients and simmer for 15 minutes. 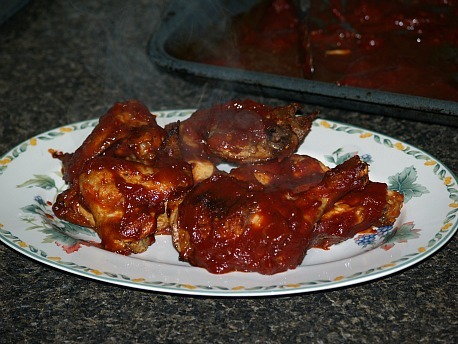 If you ask people from the North how to cook barbeque chicken some would give you a recipe like this; a stew with a heavy barbeque sauce added to it. It is hot and hearty for winter but has the great flavor of barbeque sauce. Marinate the chicken in the bbq sauce overnight. Cook in an oiled skillet until done; remove from skillet and cut into cubes. Melt butter in skillet and sauté’ onion and green peppers. Sprinkle in the flour and add the chicken stock, potatoes, tomatoes, salt and bbq sauce. Bring to a boil and add the chicken cubes. Simmer until the potatoes are tender, about 35 minutes. The following way of how to cook bbq chicken is to prepare the bbq sauce recipe and constantly brush on the chicken as you cook it on the grill. You could also pour some sauce over the chicken and roast it in the oven. The roast chicken cooking time should be about 1 hour in a preheated oven at 350F degrees, but check for doneness. Combine all of the following ingredients and simmer for 1 hour. 2 Tablespoons finely chopped onion. If you ask some people how to cook bbq chicken, they will tell you it has to be done in the Crockpot. For many this is the only way they cook. Combine all ingredients in Crockpot; cover and cook on high 4 hours. When chicken is done, shred with a fork or pull apart in chunks. Note: You may need to add a little water to cook.